The movie Taken is my favorite action movie ever. Today, the sequel premiered. While I’ve been eagerly awaiting this release for the last few months, I also had concerns. For a blockbuster hit, the original Taken was a relatively low budget film. After its initial success, more money was pumped into the sequel. Part of what I love about the original is its simplicity. It doesn’t have all of the bells or whistles of some action movies. There aren’t ridiculously extreme circumstances. We don’t see cities destroyed. It’s simply about a highly trained man on a mission to save his daughter who has been kidnapped into an all to real underworld of human trafficking. After some intial plot development, the original Taken was all action. There weren’t any corny jokes, they didn’t slow us down with some love story subplot. It was just Liam Neeson killing bad guys. For the sequel, there was no way that it was going to be as good as the original. I wasn’t expecting that going in. I think that part of why Taken was so great was that you didn’t know everything to expect from Liam Neeson. For Taken 2, we’re corrupted by knowing his character and what he’s capable of. I was just hoping that they would stay true to the roots of the original and still create an intriguing film. 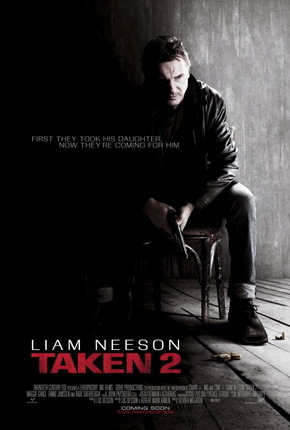 Without ruining the movie, the premise for Taken 2 is essentially that relatives of some of the traffickers who were killed by Liam Neeson in Taken are trying to avenge their deaths. Neeson is doing freelance work in Istanbul when his ex wife (who’s separated from her second husband) and daughter join him. Liam Neeson and his ex wife are kidnapped and it is Neeson’s daughter who must help them. I was aware of that part of the plot going in, and it was one thing that concerned me. Liam Neeson is getting help fro mhis daughter? His daughter is a normal girl in Taken. They’re not going to have her suddenly fighting like she’s on SEAL Team 6 are they? For the answer to that specific question, you’ll have to watch the movie..
For me, and I think for anyone who loved the original Taken, what I wanted to see was Liam Neeson’s old antics in new and dramatic ways. In general, I am a huge fan of Liam Neeson and I feel that his screen persona is perfect for the role of Brian Mills. I feel that he comes off naturally in this role and his character is compelling. One cinematic criticism that I have is that in some of the fight scenes, I felt that the camera switched shots too quickly which made it difficult to see what Neeson was doing. Overall, I liked the movie. For anyone who’s a fan of Taken, I think Taken 2 is worth seeing. I thought that the action was good, the fight scenes were generally excitin, and at times, the suspense competed with the original Taken while the film as a whole simply could not live up to the magic of its predecessor.